Playing with Papercrafting: Birthday Buffet Left Overs! 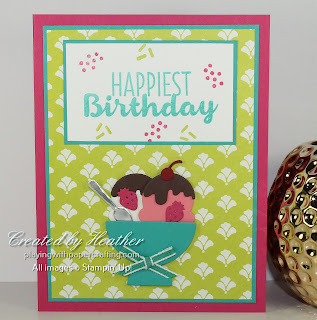 Using the Cool Treats stamp set and Frozen Treat Framelits, this card reminds me of a Soda Shoppe with its bright colours! I love Lemon Lime Twist and Bermuda Bay together and Melon Mambo turns up the intensity a notch or two! 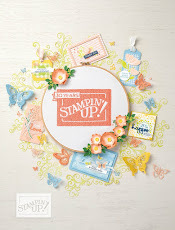 The stamp set was used for the sentiment and embellishments around it, while the framelits die-cut the bowl of ice cream that forms the main image. 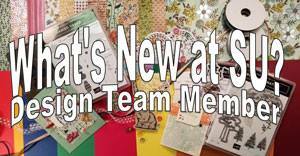 The background paper is from the Fresh Florals Designer Series Paper Stack. 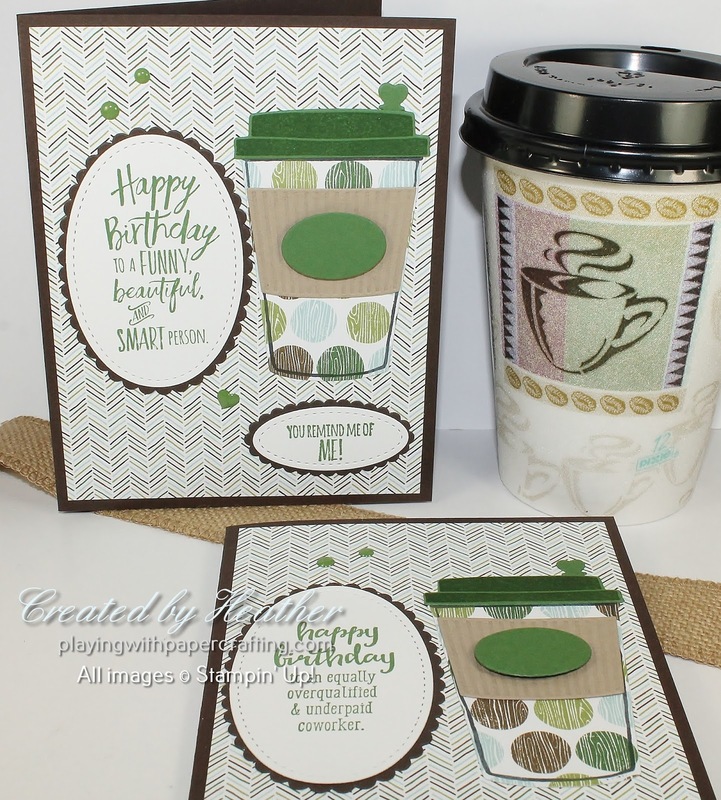 This is one of a pair of cards made with the Coffee Cafe bundle and the Five for All stamp set. 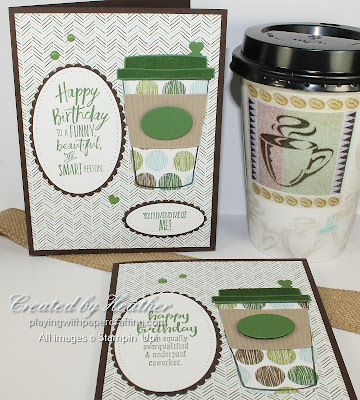 I love the way the coffee images and the humorous sentiments from Five for All work together in these cards. 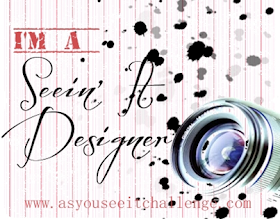 The background Designer Series Paper is from the Coffee Break DSP. 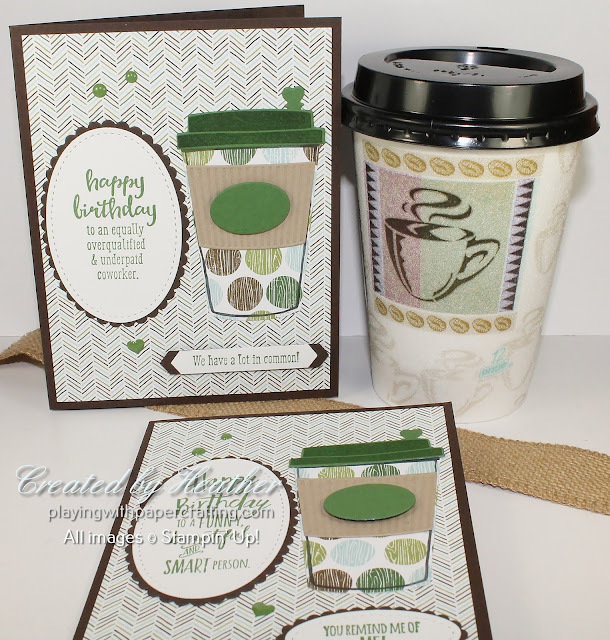 It has some great background designs that would work with a variety of cards, not just ones associated with coffee. 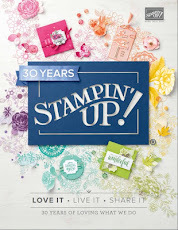 I'm still loving the coffee cup sleeve you can die cut AND emboss using one of the framelits from the Coffee Cups Dies. It's so clever! The Stitched Shapes Framelits came in handy for the ovals on these two, backed by scallop ovals from the Layering Ovals Framelits. I guess you can tell I'm in a kind of a hurry today. I'm excited to be going to see Billy Elliot on stage tonight and in two days my girls are coming home for a week's visit with the grandkids, so I'm madly trying to get the house ready for that! We're having a Mom & Me class right in the middle of their visit and my grandkids will be taking part so that will be a first. Since two of my grandsons will be starting school for the first time in September, I'm planning on having everyone make a personalized pencil case using the Stampin' Up! Wide Stamp cases (the ones the wood mount stamps come in)! Have a great weekend! Sometime next week, I should get my pre-order of my new Holiday Catalogue goodies, but with all the grandkids here, I might have to wait a week for the unboxing video! It's going to be near impossible to film it otherwise, with all the child energy floating around. 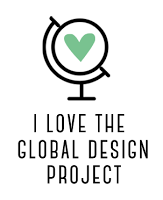 But who knows, maybe there will be a spot of time I can do a FB live session for you. We'll see!